Towing a trailer of any sort can be either an enjoyable experience or a difficult one. Ideally, you should be more than just comfortable with towing your fifth-wheel trailer; you need to be confident and well prepared. There are certain variables to be aware of before heading out on the road. Preparation before and during your trip can make everything safer and easier for everyone involved. You should also know what to look out for in terms of weather and road conditions. It is important to cover all your bases to avoid mishaps. In this article, we’ll talk about everything there is to know about towing a fifth-wheel trailer. Fifth-wheel trailers are heavy-duty RVs. Along with travel trailers, they offer almost all the luxury of a motorhome. Some even have bi-level floor plans and are capable of holding up to 10 people. All of these factors add up to some serious weight. You need to know how much weight your truck is capable of towing and respect that limit. Do not assume your truck will be able to tow the weight of any fifth-wheel trailer without first checking. What you need to know is your gross combination weight rating (GCWR). This rating is how much weight your tow vehicle can handle, including a trailer. This number tells you what you can load in the truck and what weight it is capable of towing. However, the best way to know the towing limit of your truck is from the manufacturer directly. You can find the GCWR in the owner’s manual or in the truck itself, usually on the inside of the driver’s side door, near the hinges. If you’re having trouble finding it, check the manufacturer’s website to determine where this information is located. Do not rely on word of mouth or unverified sources when it comes to the GCWR. Overestimating how much your truck can tow can damage your truck or trailer, and can cause serious accidents. For peace of mind, you might want to check the weight yourself using a professional truck scale. For accuracy, load up your truck and trailer as you would if you were going on a trip. Hitching a fifth-wheel trailer to a truck can take time to get used to. The process will depend on the make and model of your truck and trailer. Unfortunately, there are no universal guidelines that suit all types. As with weight limits, it is best to follow your manufacturer’s guidelines explicitly. Both your truck and trailer owner’s manuals should contain everything you need to know. There are a lot of variables that come into play which you need to be aware of. A few examples include the type of hitch you purchase, the measurements of your truck bed, and the installation process. For example, if you have a short-bed truck you might need to use an extended pin box. This device will allow for more clearance between your trailer and the truck cab, by extending the kingpin connection. 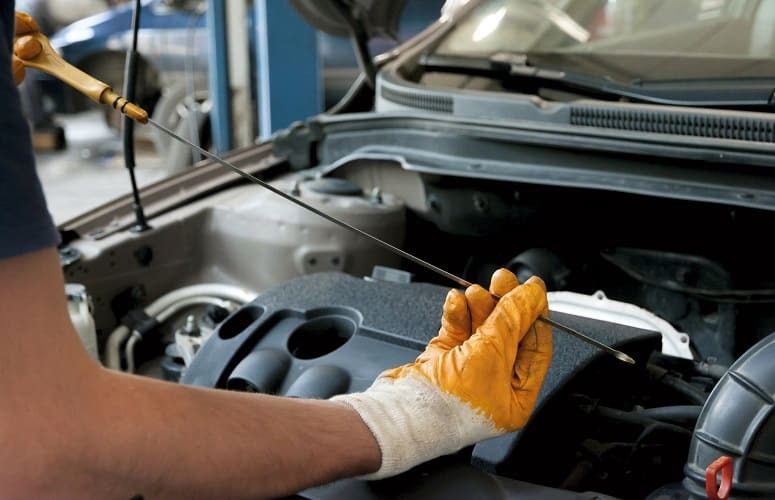 Depending on your skill level, you might need to involve a mechanic. 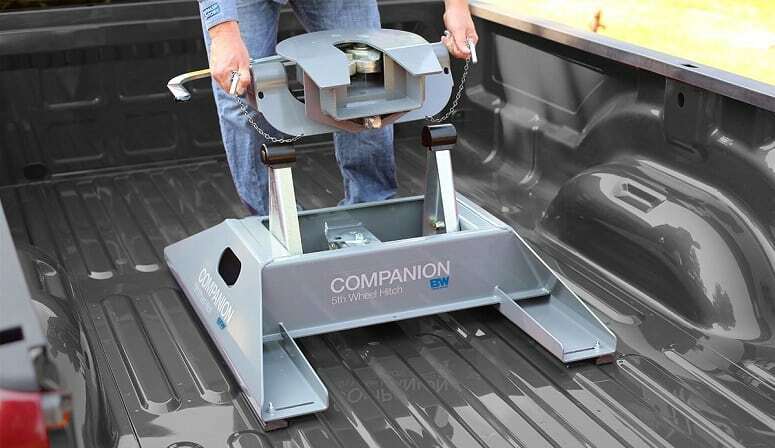 Anchor points must be installed in your truck bed to set up the jaws for the trailer. If you choose to buy a hitch not intended for fifth-wheel trailers, it may need to be modified to fit your truck. To save yourself the effort, purchase an appropriate hitch directly from your vehicle manufacturer. You need to know the intricacies of how the hitch for your truck and trailer work before setting out on a trip. Practice hitching and unhitching your fifth-wheel until you are at ease. Many trucks have the option to shift into overdrive. This is intended to save you gas by reducing your engine’s output. It can help protect your engine from wear and tear on lengthy journeys. If you have never used it, it might be tempting to try it out on your fifth-wheel trailer. However, there are reasons you should reconsider. In the majority of vehicles, overdrive is not intended to be used during towing. Fifth-wheel trailers are not lightweight. If your engine is not operating at full capacity, it can cause a lot of strain. And you definitely want to avoid overstraining your engine! Depending on the make and model, towing in overdrive can result in excessive shifting. Your truck can bounce between overdrive and the gear beneath it. Not only can this wear out your transmission, but your truck will not perform as smoothly. This doesn’t necessarily mean that you should never tow your fifth-wheel in overdrive. Doing so on a flat road in good weather conditions is unlikely to cause any issues. Still, it should not become a habit. It’s always best to be over-cautious and avoid problems. You should be careful not to use overdrive over difficult terrain. This includes areas with steep inclines or very hilly areas. These are the situations that are most likely to result in extra stress on your transmission. You don’t want to have to include a visit to a mechanic on your RV adventure. You can never have enough mirrors when towing a fifth-wheel or small trailer. You need to see all the angles, and your truck’s rear view mirrors are likely to fall short. Extended mirrors that attach to your rearview mirrors will improve your line of vision dramatically. Aside from safety, additional mirrors can make handling your trailer less difficult. The more you can see, the easier parking, driving and maneuvering your fifth-wheel will be. You have choices when it comes to adding mirrors to your truck. If you take your fifth-wheel trailer out frequently, you can opt for a permanent installation. However, this will involve modifying your truck’s rear view mirrors, and possibly voiding your warranty. If you’re looking for a temporary solution, you can buy removable mirrors. These can be clipped on and removed after use. Universal clip-on mirrors work with almost any model of truck. If you do prefer to upgrade, choose a manufacturer-specific model. These are mirrors that are designed by the manufacturer to fit to your particular truck brand or model. As with hitches, it’s usually a better option than a one-size-fits-all version. If you want to go one step further, you can invest in a rear camera. Attach it to the back of your trailer to cover all the blind spots. As with any trailer, it will take practice to get accustomed to handling a fifth-wheel trailer. Even if you have towed one before, allow yourself to adjust when you get a different one. Not every trailer handles exactly alike. The best strategy is to take your fifth-wheel to an empty parking lot. You can practice maneuvers at your own pace. Being worried about hitting another vehicle or a frustrated motorist will not help you learn! 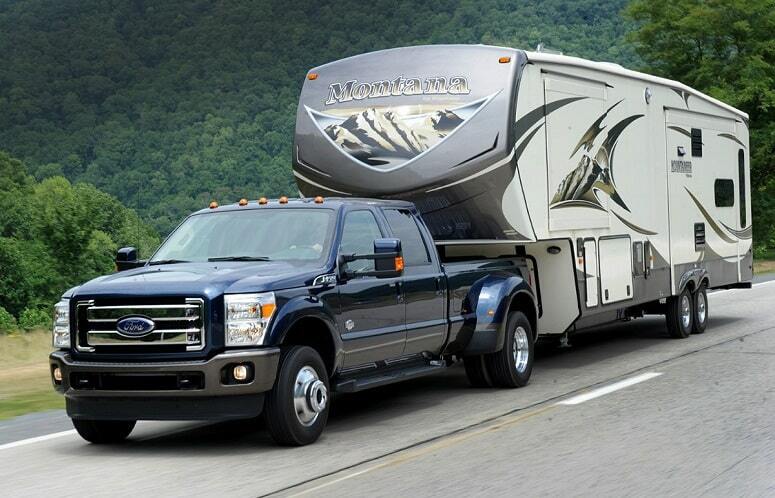 Be gentle with acceleration and braking when you are towing a fifth-wheel. Due to its weight and size, your trailer can pick up speed faster than you expect. Slamming down on the brakes abruptly can result in skidding, swerving or jackknifing. Get used to being aware of your trailer on the road. Avoid tricky maneuvers, like overtaking other vehicles, until you are 100 percent comfortable with your fifth-wheel. If you are intimidated about learning to park your fifth-wheel, don’t be. With patience and practice, you will get the hang of it. Parking is where the extra mirrors I mentioned earlier will be of use. You can have another person direct you outside of the vehicle at first. This will help you start to get a feel for the dimensions of your fifth-wheel. Turning with a fifth-wheel trailer requires practice, particularly when backing up. You must get used to making wide turns and approach corners slowly, to avoid collisions and accidents. You need to be thoroughly comfortable with turning before going out on the highway. Don’t neglect regular maintenance checks. These should be done before you start on your journey. Detecting and fixing issues before you hit the road can save you trouble later on. It can also help you avoid costly repairs. If you’re about to head out on a long journey with your fifth-wheel, remember to also check your truck. Do this even if it’s not officially due for a regular inspection based on mileage. Check the oil level, tire condition, brake fluid, etc. If your truck is older, you might want to take it to a mechanic for a thorough inspection before setting out. Before you set out for adventure, take your fifth-wheel for a test drive. Pay attention to signs of misalignment, like the trailer canting in one direction. Work the brakes to be sure they are functional. The condition of your trailer tires can make a big difference to how it handles on the road. Ensure your tires are not lumpy, worn down or flat before heading out. Take the time to check your tires throughout the trip, for low pressure or damage. Make sure everything related to your hitch is in working order. Loose bolts, a bent kingpin, or stiff mechanisms must be addressed immediately. Examine lug nuts to test that they are tightly fitted and not cracked. Nasty weather is something all drivers want to avoid, particularly with a trailer. When you are towing a fifth-wheel, you need to know what to do if the conditions change. Think slow and steady if you are caught in a downpour with your fifth-wheel trailer. Heavy rain makes it difficult to see the road behind and in front of you. Remember that wet roads increase the risk of aquaplaning. This is no joke when towing a heavy trailer—be extra gentle with the brakes and accelerator. Leave more space between your vehicle and the traffic in front, allowing for extra braking time. Clear visibility is crucial when you are towing a trailer. You need to know your proximity to other vehicles and, as above, keep your distance. Making tight turns can also be extra hazardous. 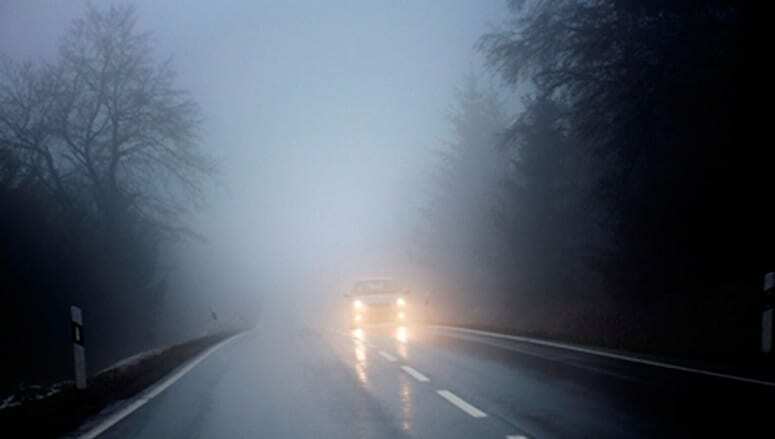 If thick fog makes an appearance, play it safe and wait until it clears. Strong winds can wreak havoc with your fifth-wheel trailer. Some trailers will be affected more than others. The height, weight, type of hitch, and more will influence how your RV behaves in the wind. Speeding up when it is windy can increase the risk of your fifth-wheel trailer swaying out of control. Grip the steering wheel firmly and keep your truck as steady as possible. Wind speeds of over 40 miles per hour can be risky, but over 60 miles per hour is dangerous. Don’t drive through powerful winds or your fifth-wheel can overturn or be blown into overtaking traffic. Pull over and wait until it is safe to head out again. There is no reason why you shouldn’t take your fifth-wheel trailer up a mountain. Traveling with a trailer RV gives you a lot of leeway in terms of exploration. Nonetheless, you do have to respect the environment you are heading into. At a high altitude, the air is thinner than it is at sea level. This means it contains less oxygen, which, in turn, can affect your truck. The climbing power of the truck will decrease the higher you go. The same is true of your acceleration—your truck won’t speed up as quickly. If that isn’t enough, the engine also has a higher risk of overheating. All of these unpleasant effects can apply to any vehicle. When you add a fifth-wheel trailer, the risk increases. There are a few things to keep in mind before taking your trailer on a mountain adventure. You don’t need to strain your truck any more than necessary when driving up mountains. Approach packing with a minimalistic mindset. You want to reduce the weight of your fifth-wheel trailer and your truck as much as possible. This means taking only items that are essential to your trip. Leave the heavy appliances and accessories at home. Keep an eye on the engine temperature once you start to make the climb. If you notice it edging into the red zone, pull over and let it cool off. Leaving on an adventure with no plan in mind is not an option when you’re towing a fifth-wheel trailer. Time-consuming detours or being turned away from a campsite is anything but fun. Fifth-wheel trailers can weigh over 15,000 pounds. These trailers can range in length from 17 to 40 feet, depending on your model of choice. You need to plan your route beforehand, to avoid areas your fifth-wheel cannot pass through. These include low-weight bridges, or overpasses with low clearance. Don’t guess your fifth-wheel trailer’s height, weight, or length. You need to have this information on hand at all times. Do you really want to be that person who gets their trailer stuck underneath an overpass? Use an application like RV Trip Wizard to figure out the best (and safest) route. You can also purchase an up-to-date database of low clearance bridges to add to your GPS. Not every site is going to be suitable for your fifth-wheel trailer. Some campsites, as well as national parks, have size restrictions in place. Popular locations, like Yosemite National Park, require early reservations. There are limited spots for trailers up to 35 feet in length. Trailers over 35 feet long cannot be accommodated. Do the research beforehand and avoid a wasted trip. The same goes for any stops you want to make on the way, such as tourist attractions. Be sure that there will be a place to park your fifth-wheel trailer. Are you ready to tow your fifth-wheel trailer out on an adventure? I hope you are equipped with all the information you need for a successful trip. Knowing safe towing practices and what to expect with certain types of trailer is paramount. The more you understand what you can expect while towing your fifth-wheel trailer, the better. You don’t need to be an expert in towing, but the basics are a must. With time, you will come to know your own trailer’s peculiarities like the back of your hand! If this article helped you, share it with fellow fifth-wheel trailer owners. Don’t forget to tell us your tips in the comments! For #10 add: Watch for low hanging trees or branches, they can sneak up on you and damage roof top items or scratch the paint. Always mind the height of your rig. Let the Passenger help keep watch.